OSIRIS-Rex, NASA’s first ever spacecraft designed to collect and retrieve pristine samples of an asteroid for return to Earth has entered its final assembly phase. 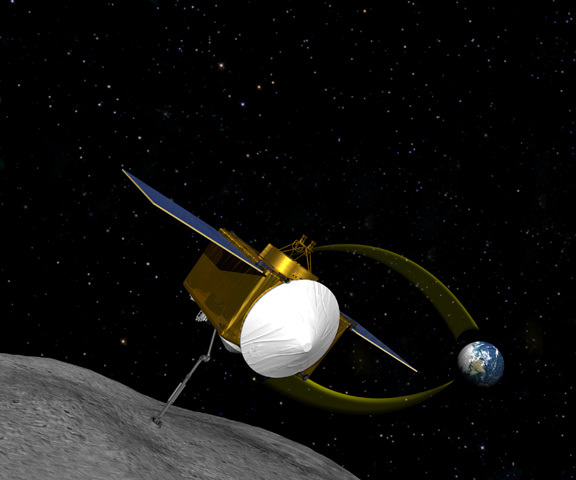 Approximately 17 months from now, OSIRIS-REx is slated to launch in the fall of 2016 and visit asteroid Bennu, a carbon-rich asteroid. Bennu is a near-Earth asteroid and was selected for the sample return mission because it “could hold clues to the origin of the solar system and host organic molecules that may have seeded life on Earth,” says NASA. The spacecraft is equipped with a suite of five science instruments to remotely study the 492 meter meter wide asteroid. Eventually it will gather rocks and soil and bring at least a 60-gram (2.1-ounce) sample back to Earth in 2023 for study by researchers here with all the most sophisticated science instruments available. The precious sample would land arrive at Utah’s Test and Training Range in a sample return canister similar to the one for the Stardust spacecraft. The OSIRIS-REx – which stands for Origins, Spectral Interpretation, Resource Identification, Security, Regolith Explorer – spacecraft passed a critical decision milestone on the road to launch and has been officially authorized by NASA to transition into this next mission phase. The decision meeting to give the go ahead for final assembly was held at NASA Headquarters in Washington on March 30 and was chaired by NASA’s Science Mission Directorate, led by former astronaut John Grunsfeld who was the lead spacewalker on the final shuttle servicing mission to the Hubble Space Telescope in 2009. “This is an exciting time for the OSIRIS-REx team,” said Dante Lauretta, principal investigator for OSIRIS-Rex at the University of Arizona, Tucson, in a stetement. The transition to the next phase known as ATLO (assembly, test and launch operations) is critical for the program because it is when the spacecraft physically comes together, says Lockheed Martin, prime contractor for OSIRIS-REx. Lockheed is building OSIRIS-Rex in their Denver assembly facility. “ATLO is a turning point in the progress of our mission. After almost four years of intense design efforts, we are now starting flight system assembly and integration of the science instruments,” noted Lauretta. Over the next six months, technicians will install on the spacecraft structure its many subsystems, including avionics, power, telecomm, mechanisms, thermal systems, and guidance, navigation and control, according to NASA. “Building a spacecraft that will bring back samples from an asteroid is a unique opportunity,” said Rich Kuhns, OSIRIS-REx program manager at Lockheed Martin Space Systems, in a statement. OSIRIS-REx is scheduled for launch in September 2016 from Cape Canaveral Air Force Station in Florida aboard a United Launch Alliance Atlas V 411 rocket, which includes a 4-meter diameter payload fairing and one solid rocket motor. Only three Atlas V’s have been launched in this configuration. “In just over 500 days, we will begin our seven-year journey to Bennu and back. This is an exciting time,” said Lauretta. The spacecraft will reach Bennu in 2018 and return a sample to Earth in 2023. Bennu is an unchanged remnant from the collapse of the solar nebula and birth of our solar system some 4.5 billion years ago, little altered over time. Significant progress in spacecraft assembly has already been accomplished at Lockheed’s Denver manufacturing facility. “The spacecraft structure has been integrated with the propellant tank and propulsion system and is ready to begin system integration in the Lockheed Martin highbay,” said Mike Donnelly, OSIRIS-REx project manager at NASA’s Goddard Space Flight Center in Greenbelt, Maryland, in a statement. OSIRIS-REx is the third mission in NASA’s New Frontiers Program, following New Horizons to Pluto and Juno to Jupiter, which also launched on Atlas V rockets. The most recent Atlas V launched NASA’s MMS quartet of Earth orbiting science probes on March 12, 2015. NASA’s Goddard Space Flight Center in Greenbelt, Maryland, is responsible for overall mission management. OSIRIS-REx complements NASA’s Asteroid Initiative – including the Asteroid Redirect Mission (ARM) which is a robotic spacecraft mission aimed at capturing a surface boulder from a different near-Earth asteroid and moving it into a stable lunar orbit for eventual up close sample collection by astronauts launched in NASA’s new Orion spacecraft. Orion will launch atop NASA’s new SLS heavy lift booster concurrently under development. If the Sun Were the Size of a Person, How Big Would an Asteroid Be? I love anything that attempts to provide a sense of scale about the Solar System (see here and here for even more examples) and this one brings us down past the Sun, planets, and moons all the way to asteroid size — specifically asteroid 101955 Bennu, the target of the upcoming OSIRIS-REx mission. A NASA New Frontiers mission, OSIRIS-REx (Origins, Spectral Interpretation, Resource Identification, Security, Regolith Explorer) will launch in Sept. 2016 on a two-year journey to the asteroid 101955 Bennu. Upon arrival OSIRIS-REx will map Bennu’s surface and also measure the Yarkovsky effect, by which asteroids’ trajectories can change over time due to the small force exerted by radiant heat. OSIRIS-REx will also attempt to collect and send back a 60-gram sample of the asteroid’s surface material. Learn more about the OSIRIS-REx mission here and here.